Sure, there are already lots of alt-outfits for Spider-Man in Gazillion Entertainment’s click-battle MMO. But this one is Superior. The costume coming to Marvel Heroes is the second tweak that Doctor Octopus has made since landing inside Peter Parker’s body earlier this year and living life as a more cutthroat crime-fighter. 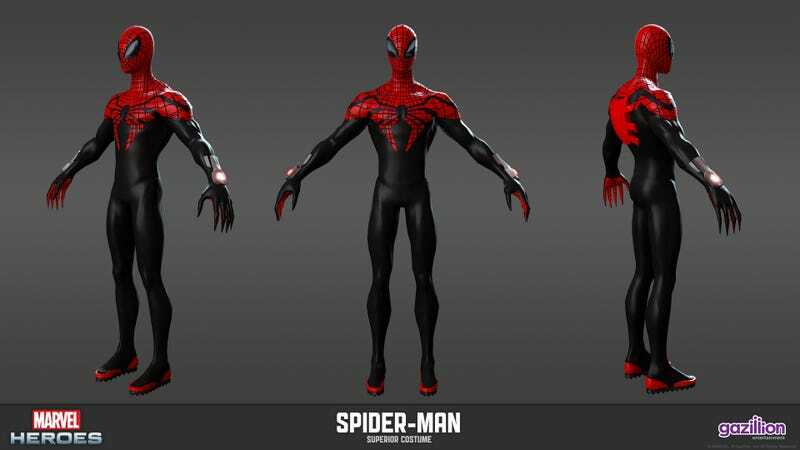 The Superior Spidey won’t just be a re-skin. It’ll come with different idle stances, movement and attack animations and will also have unique dialogue, too. Voicework for the Otto Octavious version of Spider-Man will be done by Christopher Daniel Barnes, who voices the Symbiote Spider-Man costume in Marvel Heroes, and also voiced Spider-Man in the mid ‘90s animated show and Spider-Man: Shattered Dimensions. If you’re going to Comic-Con this year, you’ll get more info on Marvel Heroes and the company’s other video game doings at the Marvel Video Games panel on Saturday.